Beat This Caption Contest 116 Winner – Caption Contest Funny Clever Witty Enter Today! 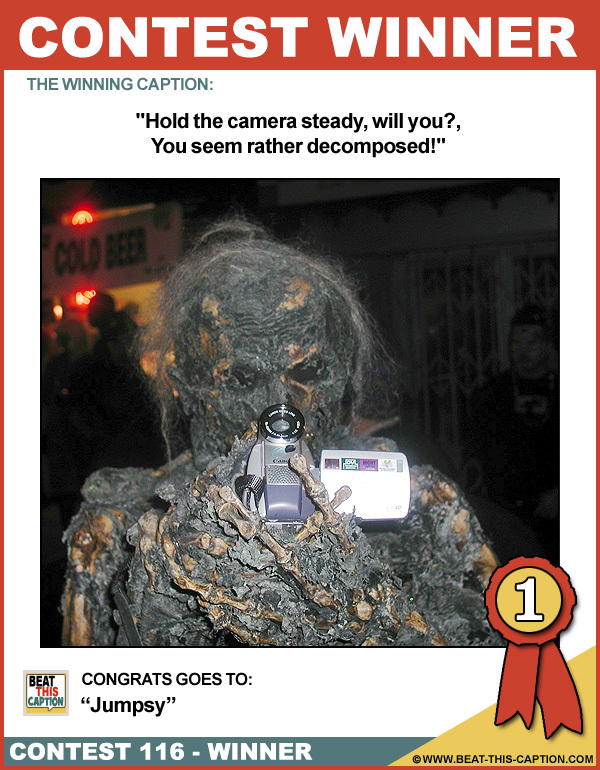 Hold the camera steady, will you?, You seem rather decomposed! LOL Look who’s talking! Great Caption, a little stiff, but still good! :) You WIN! Too late I’ve died of exposure! Hitchcock – still making films in 2012! New technology always petrifies me! I got this for all those live action…..uh……never mind! I was on my deathbed but stood in line for this latest gadget! What our grandchildren will look like when the deficit is paid off!